My exercise program is falling apart. There’s just no good way to keep up my running efforts at this point in the legislative session. The days start too early, I end up working too late, and I’m generally tired enough that any excuse to avoid physical activity is now acceptable. So I’m left sneaking a somewhat vigorous walk (not a run because, uh, I’ve fallen out of shape) only a couple of times a week. Last Sunday was the first time I walked my favorite route on the downtown Hike & Bike Trail since the Senate redistricting map was finally made public last week. It was the same route I’ve covered literally hundreds of times before. I was on the same path. I passed the same Austin landmarks along the way. I followed the contours of the same river – the one we in Central Texas call Lady Bird Lake, which creates the belt line of Travis County. But this time – or, at least, under this map – my short little trek took me from a Travis County Senate district right into another Senate district that runs over 200 miles down to another river – the Rio Grande. And it happened without me every even stepping off the trail. You’d think a fellow could burn more calories walking from the Downtown Austin YMCA into a jurisdiction based in Laredo. Yes, after a lot more weeks of waiting than there are weeks left in this session, we’ve finally seen a map showing which senators could represent which voters for the next 10 years. As Travis County residents have come to expect from the legislature, it’s not a map that represents our communities or respects our history. For years, the legislature has seemed intent on dividing Travis County wherever and whenever possible. (You can read more about redistricting here and here). 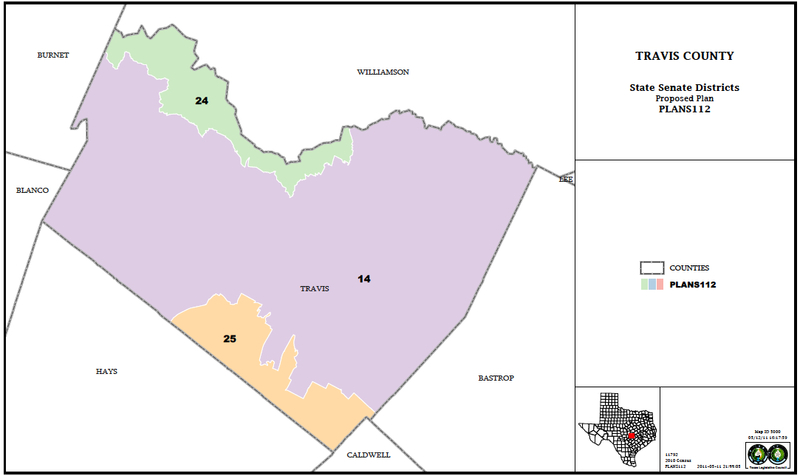 In 2003, the Legislature spread Travis County voters among three different congressional districts – even though the county is easily big enough to contain a congressional seat within its boundaries. And now, there are proposals to dilute Central Texas’ voting strength even more. Also, on the State Board of Education map, legislators have refused to unite the county in one district, instead proposing to dilute the county’s influence between two of the 15 seats on the board. And now, on the state Senate map, the county wouldn’t have even one district wholly contained within our boundaries, even though, again, the county could easily hold one. 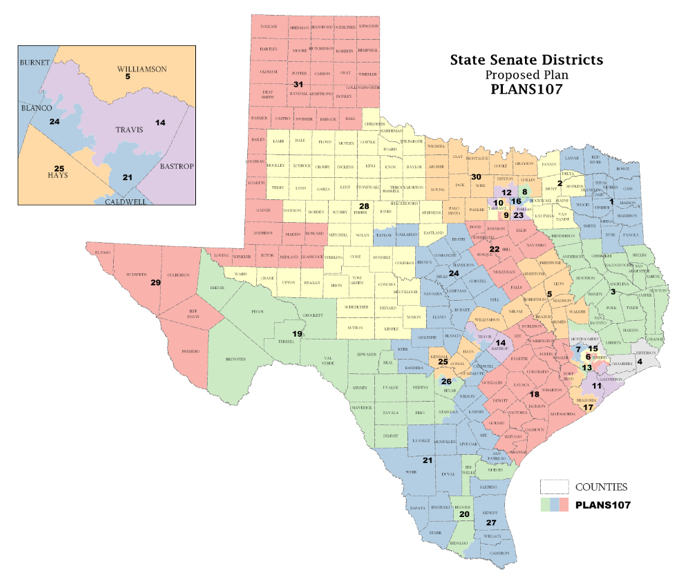 The district I currently represent – District 14 – would continue to be anchored in Austin and Travis County. District 14 would have about 67 percent of Austin and around 72 percent of Travis County in it, but the rest of the county would be split between three other Senate districts. I would also represent all of Bastrop County. So hundreds of thousands of our Travis County neighbors would be represented in the Senate by folks from around Laredo, San Antonio, and a district that runs around 200 miles up to Abilene. There’s naturally been an enormous amount of interest in this map for months. But it became public only last week, less than three weeks before the end of the session and a day before a critical public hearing on it. And the Senate will probably vote on it today. Something affecting so many people deserves a lot more openness and input. And it’s no surprise that the product of such a closed process is such a mess. For decades, minority voters in Travis County have successfully joined in coalition with like-minded others to elect the candidates of their choice. There’s no good reason to split up and divide this compact, cohesive and mature coalition in this way. But that’s exactly what this proposal would do. Now the truth is that even under the map that the legislature is considering, I’d know my new district very well. And the voters in this part of the world know me pretty well, too. In Travis County, I’d continue to represent folks I’ve been serving and working with for almost 15 years. And with all of the regional efforts I’ve been involved in over the years, I’ve developed deep friendships and relationships in Bastrop County. I’d enjoy the chance to represent folks there. So if this map holds, then this is a district I will run in – and that I’ll win in. This is about the people of Travis County, who may soon be divided yet again for no good reason. And this is about a process that has excluded them. The state should have been able to do better. A big problem is that there’s no certainty the state will do better. In fact, it’s quite possible that the state will do worse. If the legislature can’t pass a redistricting map – or, if the legislature does come to an agreement and the Governor vetoes it anyway – then the decision goes to what’s known as the Legislative Redistricting Board. The group consists of the Lieutenant Governor, Speaker of the House, Comptroller, Attorney General and Land Commissioner. This is, as a lot of folks know, a pretty one-sided group when it comes to partisan politics. And redistricting isn’t something like the budget, where active constituencies, shared values and a clear vision tend to improve end products over time. No, this is a partisan exercise. And we should all remember from 2003 that as diverse voices are cut out of the process, politics gain potency and products get uglier.